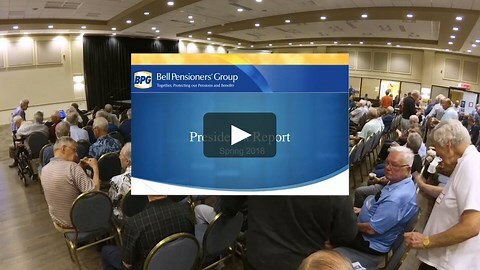 The Bell Pensioners' Group (BPG) is an association of pensioners and employees (see Membership) from Bell and its affiliates. It is a not-for-profit organization incorporated in 1995 and advocating on behalf of the more than 30,000 retirees of Bell and their beneficiaries, a third of whom are paying members. Its activities are financed solely from membership dues. The BPG is a founding member of the Canadian Federation of Pensioners, a growing network of pensioner groups, that together represent 250,000 retired individuals across Canada. The primary objective of the Bell Pensioners' Group is to protect the Bell Canada defined benefit pension and benefits of its members. supporting pensioners’ representatives on the Bell corporate Pension Information Committee (PIC). Our goal is to inform our members on current Bell pension and benefits issues and where necessary to assist them in addressing their particular problems in these areas. Video of the President's report presented by Patte Seaton, BPG President. Many members have requested this most detailed recent report on the BCE pension plan. BPG Turned 20 in 2015! Here is a brief retrospective of our history. January 16, 2017 - The possibility of the Federal government taxing our health and dental benefits. February 13, 2017 - Follow-up on employer-sponsored health and dental benefits taxable. December 20, 2016 - Several labour groups have received media attention recently, with strongly-worded criticisms of the proposed legislation. November 21, 2016 - Legislation finally tabled to permit Target Benefit Plans. November 21, 2016 - 2016 President’s Report given by Patte Seaton. "Being a DB pensioner is a Risky Business"
May 9, 2016 - Bob Farmer,former President of BPG, recently published an article in the first issue of The Observer, a newsletter of the APCM - The Association of Canadian Pension Management. March 25, 2015 – More information on the BCE-Sun Life Agreement. March 25, 2015 – Check out the Question and Answer document on the BCE-Sun Life Agreement.